You just have to love Trey Gowdy!! On Sunday, Trey Gowdy had an interview with “Fox News Sunday’s” host Chris Wallace who asked him for his opinion of how President Donald Trump has handled Russia — especially after growing evidence suggested that Putin’s government tried to meddle in the 2016 election. “It wasn’t Donald Trump who laughed when Mitt Romney said Russia was our number one geopolitical enemy and it wasn’t President Trump who handed that awkward ‘reset button’ to the Russians,” the prosecutor-turned-lawmaker continued. Gowdy was referring to a 2012 debate between Obama and Romney, during which the 44th president laughingly dismissed the Republican candidate’s warnings about Russia and actively downplayed the risk of Putin being a foil to America. The “reset button” referred to a cringe-worthy moment in 2009 when Hillary Clinton, then the secretary of state, presented a cartoonish red button to Russian Foreign Minister Sergei Lavrov. That childish stunt was supposed to send a message that relations between the two superpowers were “reset” to perfect, and diplomacy would be magically improved from that moment on. In a bungle that predicted the entire scandal-filled Hillary and Obama era, however, the button was incorrectly labelled “OVERLOAD” in Russian, making an awkward photo op even more confusing. 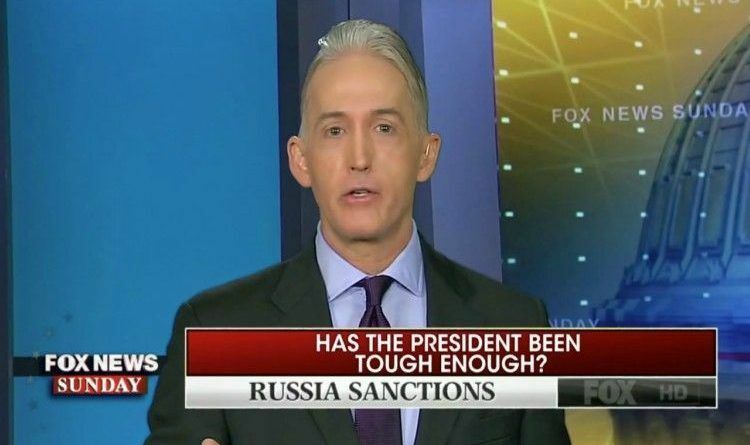 Gowdy went on to explain that although the media and the left have been attacking Trump for being chummy with Russia, it was actually Obama who should be receiving that criticism. “It wasn’t President Trump who said on a hot mike, ‘I’ll have more flexibility in my second term.’ All of that was President Obama,” the congressman reminded viewers. Trey Gowdy stands up for what is right and what is wrong! And he is Absolutely correct! That hot mike incident broke it for me, Obama telling the Russians that he could be even more flexible after elections. The Russian collusion investigation should have been done on HRC and the DNC where they actually found collusion and the Obama administration caught on tape saying I can do more for you after the election. Why would a President tell this to an enemy? ?